I've got lot of comments and visitors on the post about the new addon rules. Part of these comments were valid, claiming that Blizzard made this move to avoid future lawsuits, or protect their customers from being forced into buying third party products. The main difference is not that "real rewards are great while rewards of simulation are irrelevant", because there are small real things like cleaning your room (reward: clean room), and (socially) huge simulated rewards like gaining "World Champion" title. The main difference is that the reward of the real thing is directly connected to the effort (the cooking creates the food directly), while simulated rewards are awarded by the simulation management. Every simulation must have an external management, while real things do not need such, since the physical rules manage them. The simulated reward is available in unlimited supply (Blizzard could give T7.5 and money cap to everyone with one minute of coding). Therefore the simulated reward itself is worthless. The value of a simulated reward is coming from being a signal of a real value. While a math grade itself is just writing on a piece of paper (therefore worthless), it signals that the owner of this worthless thing also owns a valuable skill: mathematics. If you gained a real reward, you solved the problem, period. If you designed a new building and it doesn't crumble, you had the necessary skills for building design. Maybe it's calculation, maybe it's using CAD software, maybe it's intelligent adaptation of existing plans. Doesn't matter. The building stands, that's the only thing matters. On the other hand simulated rewards can be gained without actually owning the value connected to it. Such gaining is called "cheating". The cheater gained the signal without the value it's meant to show. If cheating isn't very rare, the signal loses it's power, no one will believe in it. Such devaluation happened with collage diploma: employers demand years of work experience because they noticed that anyone who is not completely brain-dead can gain a collage diploma. Devaluation of the signal is a harmful to the simulation management. Since the belief in the signal decreases less customers will pay for their services. Cheating methods are wanted by several customers who want to get the signal while not having the skill. They are ready to pay for it. On the other hand the simulation management is trying to stop cheating, since it damages their long term business model. While cheating methods has customer retaining power, the cheaters are such customers that does not worth retaining. While they do pay service fees to the simulation management, they also devalue the "product", making it harder and harder to find new customers. Commenters of the original post seemed to believe in "users like addons, so addons are valuable". No! If addons make the game "too easy", they harm WoW, they damage their business model, and Blizzard will try to stop them. They all seemed to believe that "addons save me time, and effort, so they are good". No! The point of the whole simulation is that you have to spend time and effort to show that you are capable of. Claiming that an addon doing it for you is "good" is just like claiming that a product that hacks the football goal table and write points to you is "good" as it saves you the effort of playing football for the cup. One can claim that WoW is not a simulation, does not try to signal any skill it's just a social game with no point. However that's a decision that Blizzard and only Blizzard can make. If they want to make it easier, they can do it, they have proven that with WotLK raiding. So if they wanted QuestHelper and Carbonite functionality, they would code it themselves. Quest targets already sparkling, so it's couple lines to make this sparks trackable on the minimap. It's Blizzard's game. And it's their rules. Blizzard already can and does prohibit cheating through addons. They can simply deactivate that command in the game. That's what happened with things like Decursive which could automatically decurse/dispel someone in your raid if you pressed the button, or Emergency Monitor which sorted your raid by percentage of health so you could always easily heal the most damaged person without even looking. What they are doing now, is not stopping "cheating" as they don't consider the allowed lua commands as cheating. They just prohibit authors from charging for their addons or even from demanding donations. Thats very different from what you were arguing about. What started out as a simple comment has turned into a post of its own. I'll have it up later today. I don't see how these posts are relevant at all to the new addon policy. They do absolutely nothing to stop these "cheating" addons from existing in the first place. "If addons make the game "too easy", they harm WoW, they damage their business model, and Blizzard will try to stop them." Yes, that may be, but nothing in the new policy suggests that they are trying to stop these types of addons. Pzychotix: because no one will publish a cheating addon without payment. He either don't write it or keep it for himself. It's pointless to work countless hours for something that gives you advantage over others, then give it to them for free. On the other hand a UI facelift can be used by others without causing me any damage, so people who write it for themselves gladly share it. Quite true, it is their rules, their game. Most people tend to forget this when nerfs hit their precious class/spec combos. Although I think for most of the social-types in game, it's always funny how they try to say "It's just a game and pointless", but they're the ones fighting just as hard for it as if it were a real-life problem with a good reward. Further, those addons may actually increase WoW's value -- someone who is leveling his seventh character to level 70 and then beyond may appreciate not having to pay attention while questing. Blizzard's new rules prohibit selling addons or asking for donations in-game -- the new rules have nothing to say about addons that ease questing, insofar as those addons don't ask for donations in game or charge players for their use. Gevlon, you're wrong on several points here. First, you don't seem to understand why people would create an addon and give it away for free. Understandable, you're a goblin. Here's the thing, that which you don't seem to understand is basically how more then 99% of the addons were made and distributed -- for free with no idea of repayment. And not just stuff you dismissivly call a UI facelift. Each addon adds to the common good. 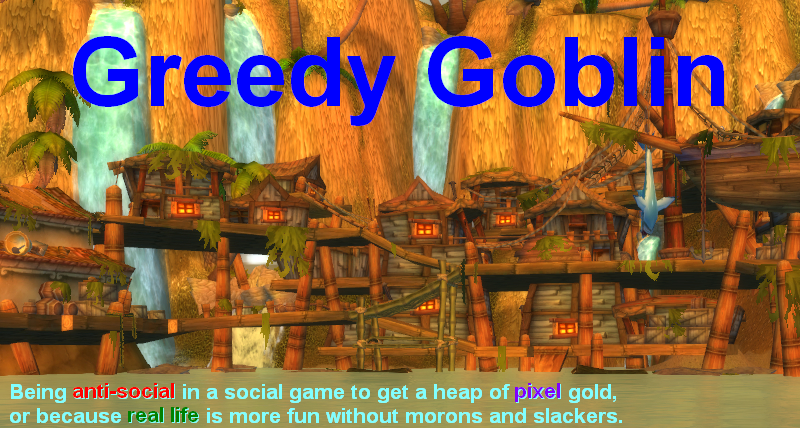 Pleople play WoW for fun. Some people write addons for fun, or out of desire to improve their experience. Addons are not massive software projects, they're frequently coded over a relatively short period of time, by one guy. By giving away the code, they can show off a bit and gain respoect from their fellow gamers. Furthermore, they stand to benefit from the work of other addon author's contribution. You think the authors of Omen just use that one addon and no others? No, each shared piece of code adds to the wealth of the whole community, which other addon authors benefit from as well as the non-coders. Unlike your auction house paradigm, if I give you a copy of a program I am no poorer for it. It is not a scarcity model, unless I chose to make it one. SUre, I give up the opportunity of selling you the software. I'm personally not convinced there's really a solid market for paid addons, and certainly not for most addons. I suspect there's very few that any people would be willing to pay for, and only a few people willing to pay for those. Also, Tourguide is basically a free version of what you calling a 'cheating' addon (and which Blizzard has pointedly not classified as such). The way I see it, there are 2 kinds of addon developers. The first kind feels like they miss something in game, so they decide to write some extra functionality to help them. They then either keep this for themselves or they make it available to others. They do this for free but if people want to donate some money they are free to do so. They either mention this on a site or use a tucked away button somewhere in their addon. The second kind feels like they can make money by writing an addon. The starting point is totally different. Monetary gain instead of writing it, because they like it and for fun. You can use this addon for free, but i'll spam you with donation requests in game. Blizzard doesn't want addons to be made where monetary gain was the goal of the addon. Everything was fine, until someone crossed the line. The line Blizzard didn't want to be crossed. Gevlon's points transcend the recent changes to the rules about addon developers charging money. Even if some addons make the game too easy and were not made for profit, Gevlon's comments are relevant nevertheless. If Blizzard wanted quest objectives to show up on the mini-map, they would let you track them. Whether an addon to let you do that was made for profit, and whether or not that addon is still allowed, does not change the point that the addon is bad for WoW overall. Believe it or not, memorizing different locations and objectives of quests is a skill that you use in the game. Those who are better at that skill deserve to have some advantage over those who are worse. Most addons, on some level, de-value some skill that a player can have. You may say that skill is trivial, but that is only your opinion. This is a game that every type of player can find something that they are good at, and make themselves better at, and that should have tangible results in the game. A player who can knock down their quests faster, because they have memorized the items they must collect, locations they must travel to, and sorted those things out in order to save time, should be rewarded by finishing them faster than other players and have more time for other things than those other players. Quest helper destroys this and negates the value of these skills. Other addons harm the game in their own ways. Step outside the way you play the game and try to see the game from afar. My point yesterday was that some addons (like Grid or Pitbull) add value with no "cheating." Blizzard incorporates some of their features into their UI updates, after all. I think Blizzard is being short-sighted here--they're not using the only possible business model. I think the better model to follow is the I-phone, which encourages developers to make applications for it and then charge a small fee for their use. These apps of course, kick some of the profits back to Apple. All most of these apps do is make the i-phone cooler (lighter app anyone? ), which brings Apple more customers. In short, they should be okay with addons that improve the product or make it "cooler." I could care less about Questhelper or Carbonite (which I think is a bad app), but I think that Grid, Decursive, Deadly Boss Mods, Omen, Auctioneer, and some of the Inventory mods make the game "cooler" in the same way that the supported i-phone apps do. They're not cheats--they just redisplay information that's available to the player anyway. I might still use my i-phone if it couldn't list all the movies in my area in a cute, convenient spot, but it wouldn't be as cool. Why not encourage Grid, Xperl, etc to charge for a download, but charge the mod authors some kind of fee? Hell, have a button on the character screen that says "check for available mods" with a list of supported mods ( that kick back some of their income to Blizzard). You could get creative with this. I just think your "all mods are bad" position isn't well thought-out. I smell some bigotry here. First of all Auctioneer is not even mentioned in this post. And then I read "So if they wanted QuestHelper and Carbonite functionality, they would code it themselves." "They're not cheats--they just redisplay information that's available to the player anyway." Don't make me laugh please, doing what some of you are doing with Auctioneer would be impossible without it. This new policy has nothing to do with "cheating" in any way. It has to do with displaying ads in game, how much the game should cost the customer and who should have the control over that. That's Apples to Oranges. The iPhone is essentially a toolbox. What the Apps do is add more tools to your toolbox. WoW is a GAME. There is not an inherent sense of competition built into cell phone usage. The Apps do not over or under balance the phone calling experience when you use them on your iPhone. Also, it's Blizzard's game. If they want to regulate what you do to it, they can go right ahead. They are the only ones that have any right to determine what level of competition we as the players should be facing. This applies to both PvE and especially PvP. It's their RESPONSIBILITY. This is just as important a part of the contract between ourselves and Blizzard as anything in the EULA. We give them money and they make sure that we get as level a playing field as possible. This is why there should be MORE outrage at the Steroid issue in the sports world. As soon as the integrity of the sport(or game in our case) is called into question, there can be no validation to the rewards OR the experience. JUST like our wonderful Goblin friend mentioned in this excellent post. Now, sports are (still relatively) free, but we are paying for WoW. They HAVE to maintain that integrity. So, if they do decide to knock out quest helpers and such, we can't say boo to it. Sorry! Addons are not cheats, they are tools. Blizzard is like the math teacher that allows you to bring a calculator to a math test. If they were the sort to allow no such tools at all they would have not have so carefully documented LUA for addon developers, but I believe Blizzard wanted a developer community surrounding their game. I am a raid healer, as such I use a unitframes addon. So what if the unitframes addon with all the features I like decided to charge a subscription, and only healers who paid the $5 or $15 or $25 a month for had advantage over other healers who refused to or couldn't pay the extra cost? This is the same reason why Blizzard bans gold selling, they don't want players willing to spend money to 3rd parties to have an an added advantage. I am behind this decision 99% even if it means no one gets some particular advantage. Why do people always say it's just a game? Blizzard is a business, and they make business decisions to protect their business/product. You can agree to their model and continue to play their (not your) game or you can disagree and they lose a customer. If they lose more customers than they gain they may change their business model, but it is completely up to them. If Blizzard doesn't like ANY aspect of the business they will change it. Blizzard equals Greedy, and I will always support that decision. I would be of the personal opinion that one could look at wow as a "operating system" of sorts. And addons are simply the different applications on it. While I do not use Questhelper, I do use addons like auctioneer and recount extensively. While I agree that this is blizzard's game, and that they have a large say in how things are to be done within it, I do feel that add-on developers should at least have a say in this considering what they have done for the game. If there had been no outfitter in the past, would blizzard have thought to implement their own in game function? The same goes for essentials such as omen or auctioneer or recount. I do not really see how using those particular addons would constitute as cheating, especially since blizzard eventually integrates the addons into the game. Yeah, I'm really not sure why people think that unit frames, auctioneer, and outfitter-type addons are cheating. Great site. I found you through Twitter. If you get a chance, stop by my blog. I find the issue very intellectually stimulating: is the real world a simulation or not. By definition it cannot be, but really, is 'reality' any different than a simulation? Some time ago, reading Gevlon made me read Veblen who very well shows that some of the status symbols we can find in the real world (such as nice cars, nice homes, money spent for leisure etc.) are nothing more than simulations of a much more violent age. When I spend money on a BMW or work hard to get a nice salary to afford the BMW I am 'simulating' that we are in a primeval age and I am the alpha male. In 'old times', trophies used to show that someone was constitutionally stronger which said something about him (always HIM). In this day and age, me getting a BMW doesn't say anything about me with certainty, but it still works as a trophy. The engineer who learns to analyse a bridge, doesn't do it because bridges are necessary. He does it because bridges are necessary for trade, transportation, vacations etc. all of which have a strong social value that he wants a piece of, by association. Honestly what really surprises me is to see this attitude on THIS blog of all places. I've been reading it for a little while, and the overall theme seems to be that performance is everything. People who don't give 110% in groups, people who's goal on the auction house isn't to take as much gold from their customers as possible, people who would even THINK of getting social enjoyment out of WoW...these people are all idiots who should be shunned and who's behavior should be ridiculed. Yet when it comes to totally legal ways to do better at the game, the goblin approach suddenly doesn't apply? "because no one will publish a cheating addon without payment. He either don't write it or keep it for himself. It's pointless to work countless hours for something that gives you advantage over others, then give it to them for free." Yeah, except people have been creating all these addons for free for the past four years. It may be pointless, but that doesn't change the fact that people are still working for free. Not to mention that people can still give donations. The policy changes nothing of that. I think that Blizzard wants to integrate certain characteristic of the add-on in the UI without being forced to pay to the add-on developers if they dont want a lawsue. Not everybody have the capacity of crushing everybody in court a la Microsoft. And, so what if some add-on developers did an emo-rage and quitted? This is the Internet, somebody else will do it with Blizzard rules (aka they will copy and paste the original add-on) and its fixed. If you dont do it for free, somebody else will. Yet this is exactly what the authors of auctioneer have done. They don't get paid, they only ask for donations. This has nothing to do with 'cheating' addons as you call them since Blizzard can easily kill anything they consider cheating. Remember when auction add-ons could automatically buy items for you - Blizzard considered this cheating and changed the LUA to kill this off.